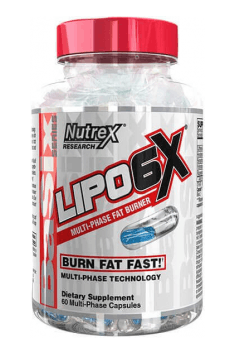 Nutrex Lipo 6X is an advanced dietary supplement reducing body fat percentage. Synergistically acting components intensify catecholamines release and stimulate lipolysis process. They also support fatty acids metabolism in problem areas, so it is ideally suited to the final stage of reduction. This supplement increases perceived energy levels, delays fatigue and helps to maintain high level of focus and motivation. Two-phase capsules ensure biological half-life of active substances. It means that one part is released immediately and the other part gradually, over time. The immediate-effect phase is aimed at reducing appetite, increasing metabolism and energy. The second release phase prolongs and maintains the supplement’s action, maximizing its effects. Caffeine. The most popular, and at the same time, one of the most effective substances that support fat burning. By increasing the level of cyclic adenosine-3 ', 5'-monophosphate (cAMP) it increases the release of catecholamines - adrenaline and noradrenaline, and prolongs their half-life. These catecholamines are responsible for body mobilization. They accelerate heartbeat, raise blood pressure, and intensify adipose tissue lipolysis (noradrenaline stimulates β-adrenergic receptors). Caffeine is also an inhibitor of phosphodiesterase, which is an enzyme that breaks cAMP, maintaining its high concentration. Stimulation of β-adrenergic receptors along with prolongation of cAMP activity enhances the release of fatty acids from adipocytes. In addition, caffeine due to its similar chemical structure to adenosine attaches to its receptors, reducing fatigue and maintaining wakefulness. Adenosine acts as an inhibitory neurotransmitter that intensifies the sensation of drowsiness and fatigue. Synephrine. Plant alkaloid with strong lipolytic properties. By attaching to α-1 and α-2-adrenergic receptors, it stimulates the release of norepinephrine, which is the most responsible for lipolysis intensification in adipose tissue. Synephrine also increases heat production in the body (thermogenesis) and speeds up metabolic rate. In addition, this alkaloid stimulates glucose uptake in skeletal muscles, and replenishes the amount of ATP during workout, what promotes better performance and causes calorie deficit. Yohimbine. An alkaloid obtained from the bark of Pausinystalia yohimbe tree. This compound works in synergy with other components, it increases cAMP levels and intensifies thermogenesis, contributing to an increased energy expenditure. As an antagonist of α-2-adrenergic receptors it promotes noradrenaline release and stimulates lipolysis, especially in the so-called ‘problem areas’. Men and woman accumulate fat in different areas of their bodies - it is deposited in lower abdomen in men, and on the thighs and buttocks in women. In addition, yohimbine reduces appetite and helps to stick to a diet during the reduction period. It also inhibits the catecholamines breakdown. Rauwolscine. It has a very similar chemical structure to yohimbine, and is very often called alpha-yohimbine. Rauwolscine is able to block α-2-adrenergic receptors, however, it is slightly more effective when it comes to intensifying lipolysis in problem areas. It also increases the metabolic rate and h optimizes the glucose metabolism. Hordenine. Plant alkaloid characterized by its activity in the central nervous system (CNS). It is an inhibitor of monoamine oxidase B (MAO-B), an enzyme responsible for catecholamines breakdown. It prolongs their activity and prevents sudden drops, maintaining a balanced level of focus and motivation. Hordenine keeps high energy level and improves exercise capacity. Summing up, Nutrex Lipo6X is an advanced fat burner based on carefully selected ingredients with synergistic action. It effectively intensifies lipolysis, suppresses appetite and increases energy and motivation necessary to stick to a diet. The two-phase capsules provide both, immediate and prolonged release of active substances, what guarantees their long-lasting and effective action. Take two to four capsules during the day, the first portion in the morning, the second in the afternoon. Take between meals. Due to its abilities of burning fat from problem areas this supplement is perfect for people preparing for fitness and figure competition, or those who are at the last stage of reduction period. It is recommended to start the supplementation from 2 capsules per day - one in the morning, one in the afternoon. With time, the dosage should be increased to 4 capsules - two in the morning and two in the afternoon. To maximize the effects, the second portion is best to be taken before the planned physical activity. Do not exceed 4 capsules a day. It is not recommended to take this supplement for 6 hours before bedtime. RESEARCH NUTREX is an American company that produces dietary supplements and supplements for athletes. Among the products of this brand there can be found, for example, amino acids blends, gainers and amino acid supplements. There are also weight loss supporting products and recovery supplements. Vegetable cellulose capsule**, glycerin, purified USP water, FD&C Blue 2. **This product utilizes only natural vegetable capsules that are free of animal products. Hordinine (N, N-dimethyl-4-hydroksyfenylo Phenethylamine) is an alkaloid occurring naturally in certain cacti and black locust (acacia), increasing the contractile force of the heart, bactericidal and bacteriostatic (retaining an adequate level of bacterial flora). Hordenine’s action is short, therefore, it is used in bigger doses. It affects the level of noradrenaline, accelerating the process of reducing depot fat. Stimulating effect. It does not occur as mono-preparations. In the supplements it is used with caffeine, Synephrine, as stimulation supplements (e.g. creatine stacks, nitrogen boosters), and fat burners.